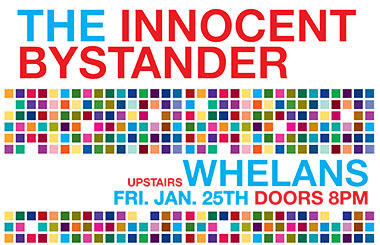 The Innocent Bystander announce Whelan’s upstairs show 25th January After a successful year in 2018 with airplay for their single Neon Lights gathering pace with Irish, UK and USA stations play listing the track and two rammed explosive Whelan’s shows. The Innocent Bystander finished the year off with another show opening for HamsandwicH to an amazing response from a another capacity Whelan’s audience. 2019 promises to be a busy year for The Innocent Bystander so don’t miss this show in such an intimate room.